On July 13th 2011 this Adbusters poster appeared online to present the Occupy Wall Street protest. It features a dancer on the top of the bronze bull which is situated near Wall Street. At the back there is a group of people immersed in a foggy atmosphere and ready to fight. There is a sharp contrast between the shape created by the dancer and that of the bull. The former, in fact, stands on one leg performing an attitude to the back (a ballet position on one supporting leg, with the other bent at the knee to a ninety degree angle) with her arms in a loose second position. Her focus is downward left, her hair is composedly combed and her sleeveless dress is tight and short. Her pose suggests a sense of balance and stability. On the other hand, the bull is portrayed in a very dynamic manner, with its forefeet off-balance to the right and its tail curled upwards. The bull was created in 1989 by artist Arturo DiModica as a Christmas present to the city of New York to praise its endurance after the 1987 stock market crash. Since then, it has become Wall Street mascot. According to Wray Cummings, there is an interesting parallelism between this picture and one of the Major Arcana in Tarot decks, that is Strength. This card presents the figure of a woman with her hands on the jaws of a lion. It is not clear whether she is opening or closing them, but the usual interpretation of the card refers to humans’ ability to tame instinctual forces. 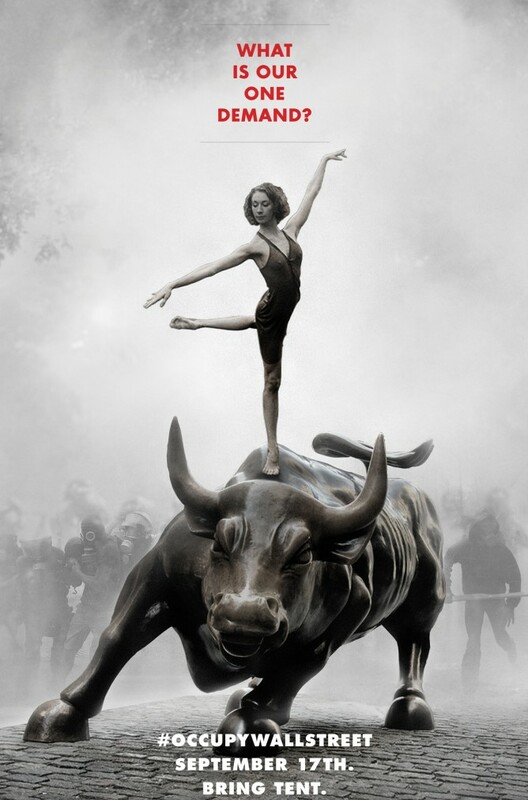 The parallelism is quite appropriate as in the case of the Adbusters poster, the dancer tames the charging bull with her steadiness and grace. It is as if non violent protests could really make a difference in a world dominated by economic powers. So far the Occupy Wall Street movement has become an almost mainstream motto to be used in numerous protests’ activities in different parts of the world. In Italy, for example, it has recently been used to promote a campaign against animal testing (see here). Watching this image, I asked myself why did Adbusters choose a classical dance pose and not, say, a hip hop one. But then maybe the contrast would not be as sharp as this one. Classical dance is a technique based on tough discipline and rigour and in the poster it is used to exemplify grace and steadiness (Cummings refers to the dancer’s pose atop the bull as improbable though) which are also its characteristics. Interestingly, classical dance has been used in another kind of political visual message, that is on the cover of Francesco Raparelli’s La lunghezza dell’onda – Fine della sinistra e nuovi movimenti (2009) [The wave length – The end of the left and the new movements], a book which analyses the Italian students’ protests (nicknamed ‘the wave’) from 2008 to 2009 as a new political agent in a country where the Berlusconi government repeatedly tended to erase the students’ rights. The cover is an interesting mix of ballet and activism as it presents the coloured drawing of a dancer performing an attitude to the back. However, if her legs are in the correct position, her arms escape ballet grammar in that they are placed one straight downward and the other bent upwards, with both hands in a fist. They eloquently express strength and the will to fight. At the back replicates of this figure announce an army of people ready to fight. The effect is further enhanced by the sense of perspective given by the baby blue rays that stem from the right low corner of the image.